Many landlords struggle to provide thorough, consistent inspections. Make sure to take detailed photos! Routine Property Inspections are key to ensuring your home is being well maintained. You set the precedence for how your home should be maintained the day you turn your home over to your tenant. With that being said, it's always best to have your home "white glove" clean and to have your carpets professionally cleaned. While you can't expect your tenants to keep it that way 100% of the time, you do set a precedence when you routinely inspect your home and provide feedback to your tenants. To protect your real estate investment, you should complete a series of routine, scheduled inspections during the tenancy. You should take plenty of photos (and/or video) and make sure to document in writing the date, time, and complete condition of each item in the household. Make sure to back up your files in case your computer crashes. These items are crucial for you to have in order to collect a security deposit or settle an issue in court. Make sure to document the condition throughout the tenancy's residence, especially if condition of the home declines under the tenants care. This photographic evidence can be used in court. Realty Masters has an inspection team which includes two inspectors and an inspection coordinator. Together, the team works to inspect all of our homes often and thoroughly. We use a 4 page, legal size property inspection checklist which maneuvers our inspectors methodically through the home and indicates interior, exterior, and mechanical issues as well as cosmetic and potential safety hazards. 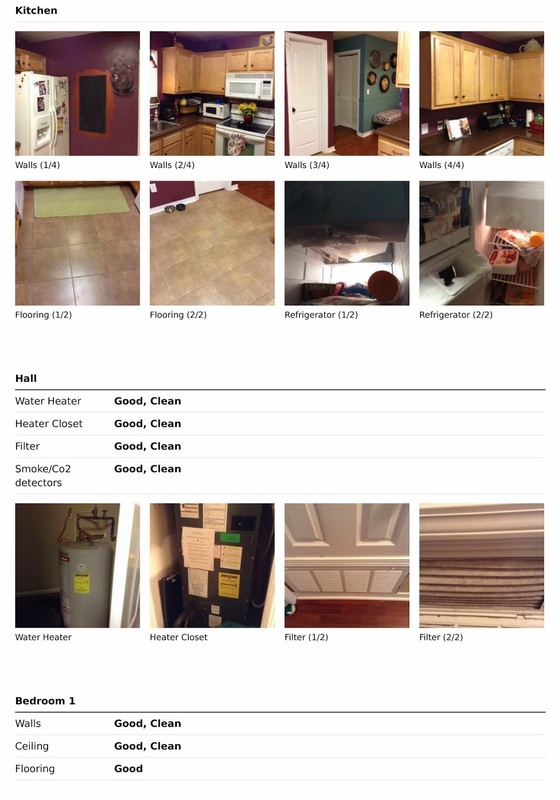 Sometimes up to 250 photos are taken of each home including interior and exterior surfaces of the home. For example, we take a photo of every floor surface, every ceiling, every wall, etc to determine the base line standard for the home. This documentation is necessary to win in a court setting. to establish a benchmark with condition. 1. Initial New Property Inspection- Full run down of how we find the home! Take pictures of every crevice and surface. We start with the full room and then zoom in to all the details including flooring, ceiling, lighting, etc. Many homeowners forget to take enough before photos and then do not have a proper photo to compare later damages to. 2. Move in Inspection- Inspection completed the day prior to a tenants move in. 3. Tenant Move in Inspection- Inspection provided to the tenant upon move in which they are required to return management within 24 hours of move in. 4. 90 Day Inspection- Inspection completed by Realty Masters after 90 days of occupancy to ensure proper standards of care for your home. 5. Renewal Inspection- Inspection completed 90 days prior to the end of your tenants lease renewal to further determine care of the home and to evaluate a lease renewal rate. 6. Move Out Inspection- Inspection upon tenants move out which dictates the release of the security deposit to either tenant or owner. Tenants are given a few days notice to prepare for their inspection. We also conduct random drive by's for all of our homes during peak lawn seasons. Per FL Landlord Tenant Laws, we do not conduct surprise inspections. Keeping your home routinely inspected and documented is the only way to keep yourself protected. This is the fifth article of our new blog series "The New Landlord: Tips & Tricks for the Profitable Landlord." Make sure to follow our blog for more advice on how to be an effective landlord! Do you have any questions for us? Feel free to ask us your Pensacola Property Management Questions! Email them to Nicoles@PensacolaRealtyMasters.com or give our office a call at (850) 473-3983.